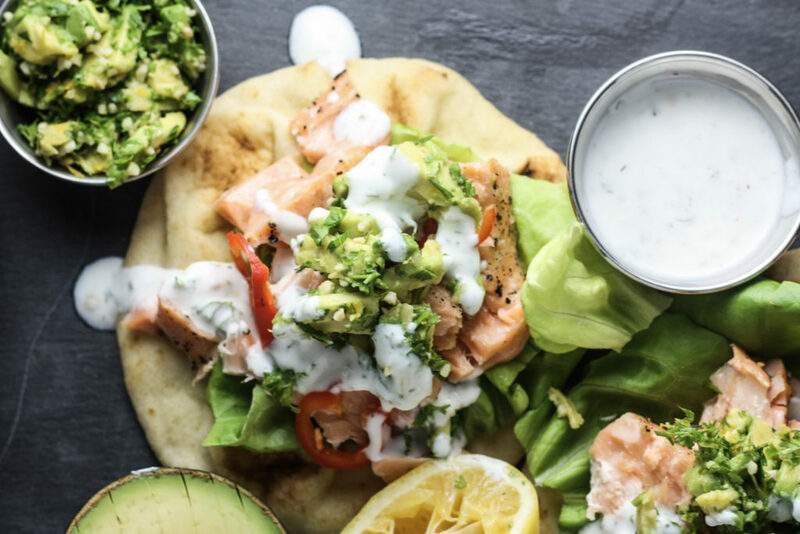 This Salmon Naan with Avocado Gremolata and Dill Yogurt Sauce is healthy, delicious and made in under 20 minutes for a perfect quick weeknight dinner. Welp, the Ducks season is officially over. We will now be going back to your regular scheduled programming. Don’t ask me if I’m heart broken bc the answer is ofcourse obviously yes ugh. But that’s the thing with sports, you love ’em and sometimes they make you really happy and sometimes they break your heart. It’s all for the love of the game. Win or lose, Ducks fly together. So considering my current state of post hockey blues, it’s probably time for a little pick me up. 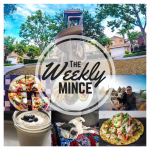 Typically, my pick me ups involve delicious food and hopefully food that is still healthy and good for me because I’ve heard that’s really important. 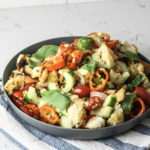 If you’re unfamiliar, as I was for a long time, Gremolata is typically a chopped herb garnish, usually Parsley, lemon zest and minced garlic mixed together and used to top dishes. With fresh herbs popping up all over my backyard, I’m constantly on the lookout for new ways to use them. Fresh herbs really bring such a brightness and freshness to dishes that I try to utilize them as often as possible. Of course I had to take the traditional Gremolata and then add Avocado to it because 1) I’m Kayla and that’s what I do 2) Avocadooooo. I also knew Avocado would go well with the other flavors of the dish. 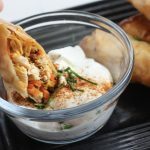 These Salmon Naan Sandwiches with Avocado Gremolata and Dill Greek Yogurt Sauce hit all the right notes and it’s really simple to make. 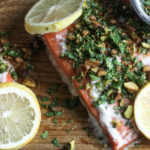 It would be perfect if you want to entertain, you can make the Gremolata and the Dill Yogurt sauce beforehand, then just bake the salmon and let everyone make their own pita with whatever toppings they want. A pita bar sounds like a lot of fun, doesn’t it? Even fun for a girl with a broken heart over her favorite sports team. 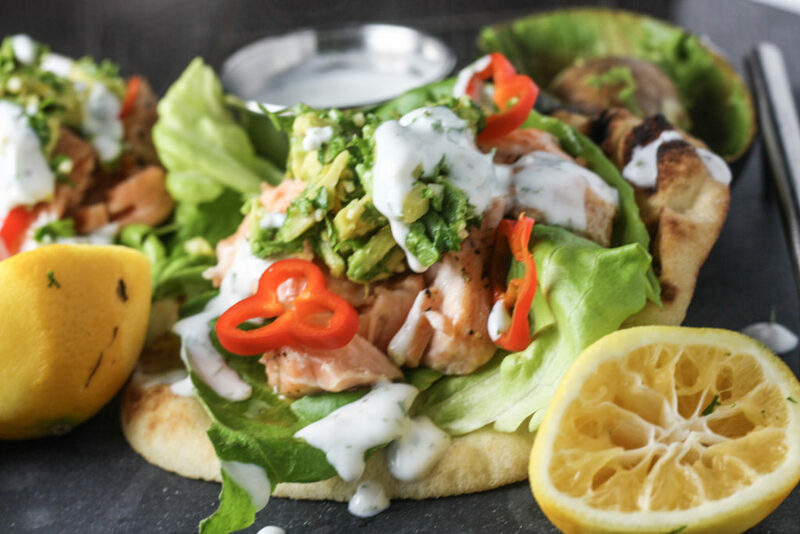 This Salmon Naan with Avocado Gremolata and Dill Yogurt Sauce is quick, easy and delicious. Made in under 20 minutes, this is the perfect weeknight dinner. 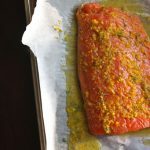 Coat salmon in olive oil, then add salt and pepper to both sides. Put on baking sheet and bake at 400 for 12 minutes. Coat salmon in olive oil, then add salt and freshly cracked pepper to both sides. Put on baking sheet and bake at 400 for 12 minutes. To make Dill Yogurt Sauce: combine Greek Yogurt, Lemon juice and Dill. Add salt and pepper to taste. Put in fridge until ready to use. To make Avocado Gremolata: Dice Avocado into small cubes and add to a bowl. Add in minced parsley, garlic and zest of the lemon. Combine well. Set aside. Once Salmon is cooked, flake with a fork. 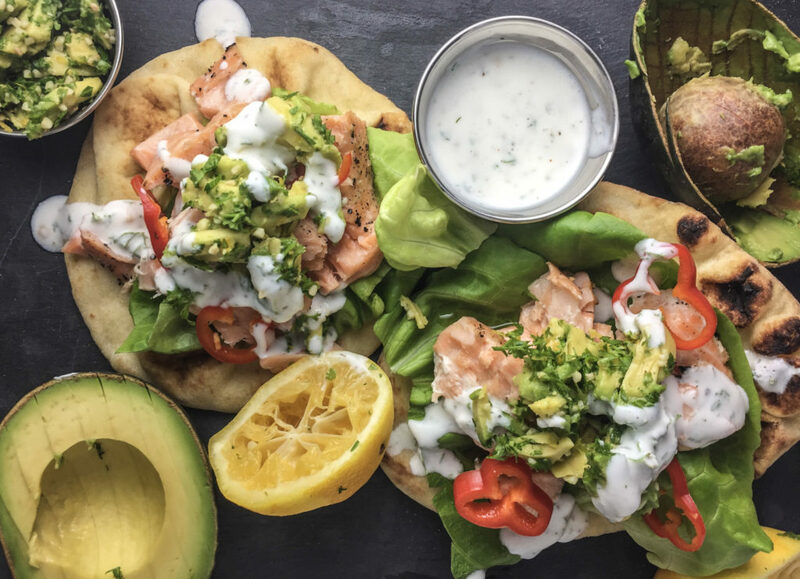 To assemble Sandwiches: lay a piece of butter lettuce on top of Naan, top with flaked salmon, add sliced mini bell pepper, Avocado Gremolata and Yogurt Dill Sauce. 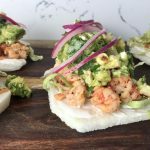 To make Keto or Paleo, remove Naan and use butter lettuce leaves to hold salmon and toppings OR use a Keto or Paleo friendly Naan or wrap.